This Wednesday, November 18th, INMM UW will be hosting a dialog on nuclear technology and security at the HUB. Come speak with scientists and government advisors, learn about opportunities at the National Labs, and eat free PIZZA! Check out our Register for Events page for more information. Tomorrow is our first event of the quarter! We will be having a dinner and discussion with Adam Stulberg, Ph.D., a professor from the Sam Nunn School of International Affairs. The event will be at 7:00 PM on Wednesday, October 21st, at Liam’s in U-Village. For more information about who to contact to get in on this great event, visit our Register for Events page. Proposals for PNNL’s Fall Conference are due TODAY!!! For more information on the conference, visit our Internships & Opportunities page. With registration going on, we want to make sure that everyone knows their options for classes to take in the coming quarters! The Nuclear Policy@UW page has just been updated with a list of nuclear policy classes to take in the summer and fall. 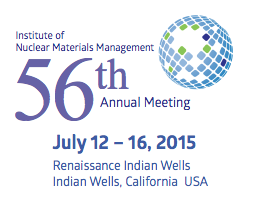 The INMM annual conference will take place July 12-16 in Indian Wells, CA. To register or find out more, visit the INMM Annual Meeting webpage. This is our big annual trip! It will be a great opportunity to visit the lab and/or tour the Hanford B Reactor! To find out more information, visit our Register for Events page. INMM UW is looking for new officers for the next academic year! If you’d like to participate in this great leadership opportunity, please apply on our Officer Application page.